This post originally appeared in 2015 on my other blog. I discovered the joys of fresh pesto a couple years ago. 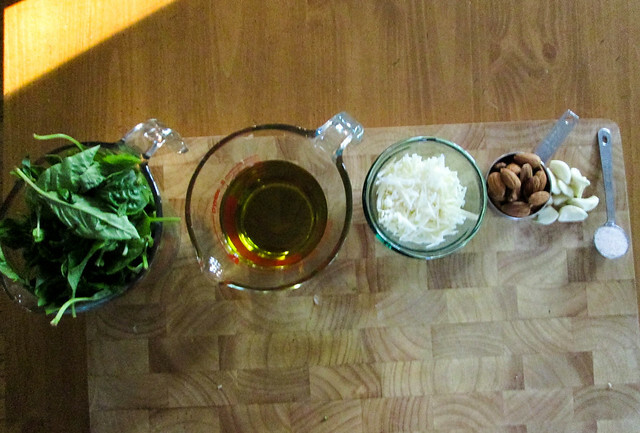 Traditionally, pesto calls for pine nuts, but pine nuts are expensive so I have never made pesto with pine nuts. I have discovered, though, that pesto with almonds is even better. A friend gave me an enormous bunch of basil from her mother’s garden (I believe their exact words were “basil forest”)–I was delighted. Basil is one plant I can’t grow very well (hardly the only one) but it really brightens all kinds of dishes. And it makes pesto. 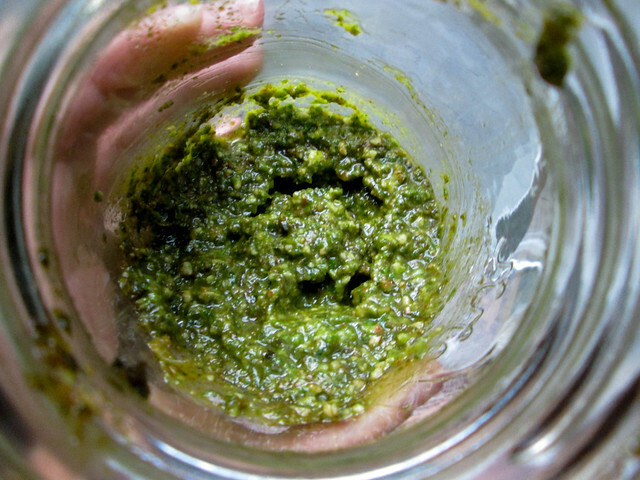 We love pesto. Pulse garlic cloves in food processor until minced. 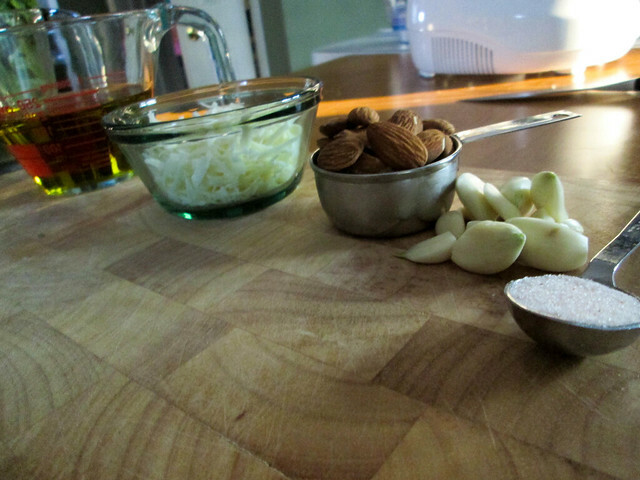 Add almonds, pulse till starting to look like coarse sand. Add parmesan, pulse till mixed. Add basil, pulse till minced. Add EVOO slowly while processor is running, add salt, run till it’s basically smooth. Then you’re done and can dip bread it in or pour it on pasta or put little 1/2 cup servings in the freezer for some other day. I think this makes about 1 1/2 cups of pesto. I only put 1/2 cup in my pesto pasta for 4 meal. More gets a bit overwhelming. Oh…did you notice that the picture shows more like 8 garlic cloves? I promise, it was more like 5 when they were covered in their little papery skins. Five hefty cloves, but only one extra for us anti-vampire garlic lovers that Zorro and I are. 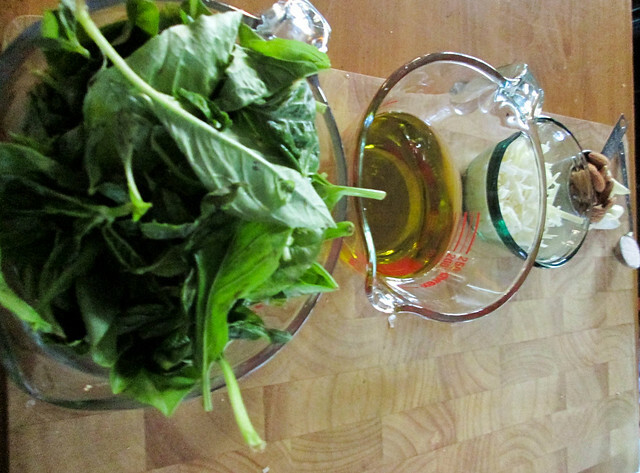 Don’t be alarmed if the top of the pesto gets brown–that’s just oxidation. You can pour EVOO on top before storing to prevent that. 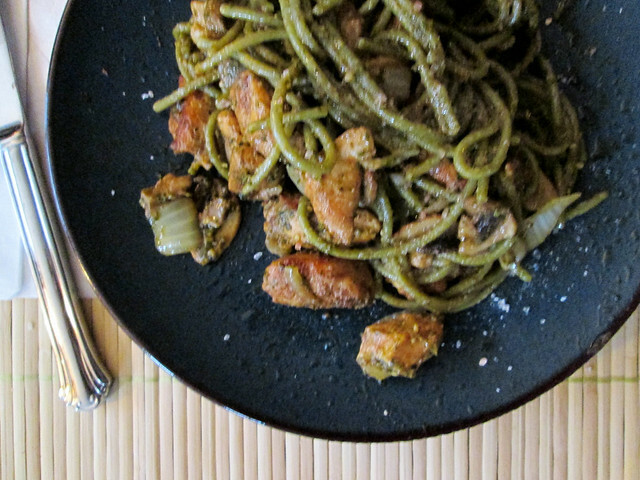 Our favorite way to eat pesto is with pasta (in this case, brown rice and spinach pasta) and chicken. I also sauteed some mushrooms and onions and mixed those in, also. We have eaten this meal three times in the past two weeks and we’re not tired of it yet. It also lends itself shockingly well to throw pillows, bags, and chiffon shirts.